So after my mammoth 11 days working in a row, I’ve had the last 5 days off (hence the many posts – I’m almost caught up on ones I had meant to post during the epic working). 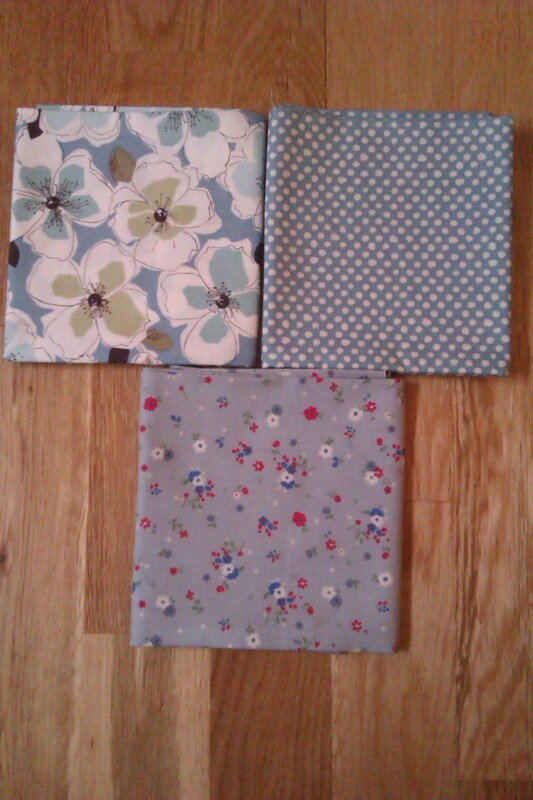 This has been bliss, and I’ve been pottering around and deciding what to make next. Usually with crafty things, I make presents for other people as it seems a good way to justify the money spent on the materials. I managed to make a lot of gifts for Christmas this year, most of which I have yet to write up on here. 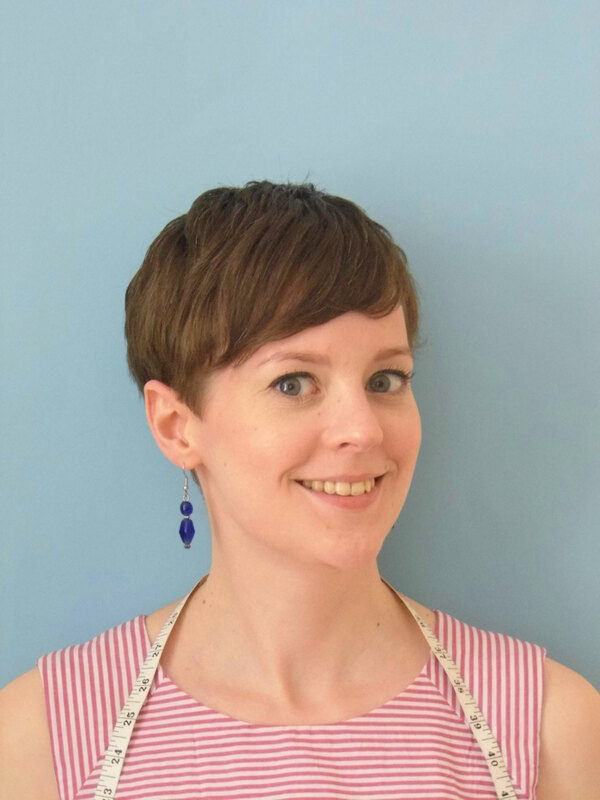 But I have decided that I want to make some stuff for myself, especially because that means I can do it all year round (without having to wait until Christmas or birthdays). With this in mind, a couple of days ago I went shopping! 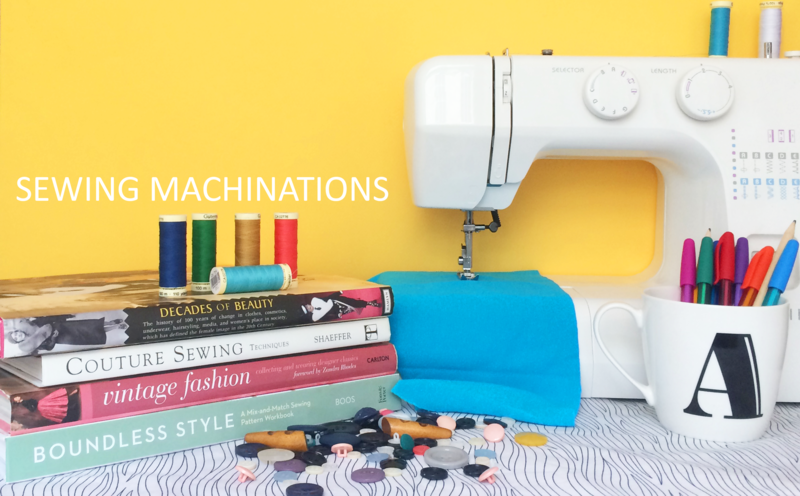 In the process I discovered a few great sewing shops I didn’t know about before, namely MacCulloch and Wallis (how did I now know this place existed, and just across the road from John Lewis, which always disappoints me?!) 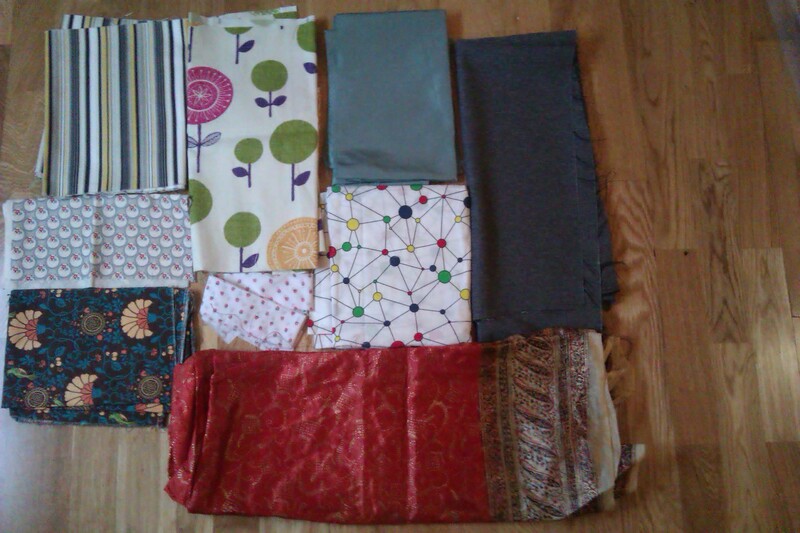 and Rolls and Rems in Holloway (I live in North London), which has a really good selection of fabric at reasonable prices. I also went back to The Cloth Shop, the little sewing and knitting shop in Wood Green Market place which took me ages to find the first time. They have an especially good range of wool and buttons. And I tried to shop in Wools and Crafts on Blackstock Road, but I find it really awkward to browse in there as they follow you around. Anyone who knows me will know that my favourite colour is blue (as you can guess from the design of my blog), but I have recently been wanting to expand the number of colours I wear and I’ve been thinking how useful it would be to have a red cardigan to act as an accent for the blue/black/grey I wear a lot. So I’ve decided to knit myself one. I’ve never knitted clothes for an adult before (I’ve done a couple of baby cardis, with varying degrees of success) so watch this space for whether I have the skill and/ or patience to complete it. 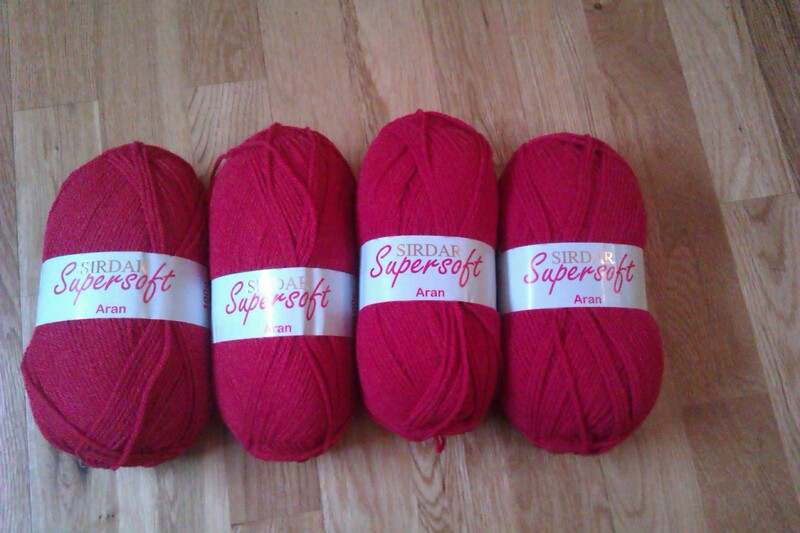 This wool was a bargainifourous £13 for 1000 yds, which seems to be roughly how much you need for a small-sized cardigan. 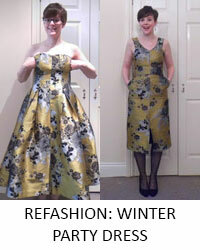 I have decided to use this free pattern which I found on Ravelry (more on Ravelry another day). 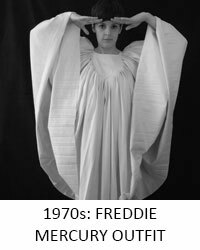 I’m going to see if I can knit it with long sleeves in stead of 3/4 length, but again, I might not have the skills to do this! 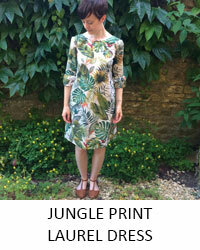 I’m way behind on the ‘let’s all sew New Look 6000′ fest that Scruffy Badger organised last year (mostly because I wasn’t making clothes then), but it looked like a good, easy pattern for my first clothes sewing in years, so I bought it and some fabric! I especially like the versions by Tilly and the Buttons and Dolly Clackett. As of writing this, I’ve cut out all the pieces and hope to have it finished by next weekend. 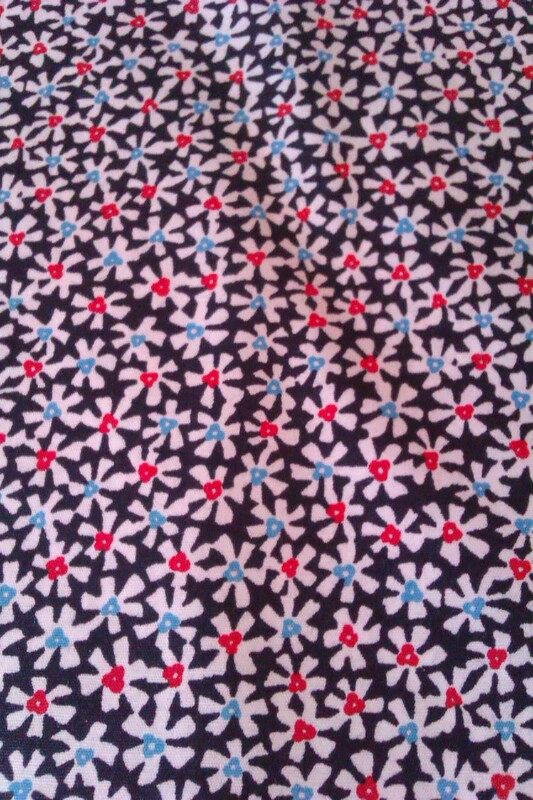 Here is a close-up of my fabric. I thought it would make the dress a bit less formal, so I can wear it regularly. I can also wear it with my new red cardigan (once I make it)! I thought I would share this picture in case anyone had any ideas what I can sew with these 3 gorgeous pieces of fabric my friend Fran gave me for my birthday. I love them all! They are 50cm square, so I’m thinking to use each of them with a plain fabric on a top (or something) that needs 2 fabrics (for an accented yoke or something like that). 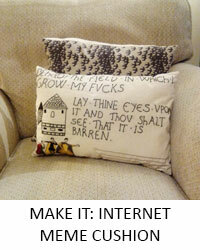 They’re too nice to make into a cushion cover, which was my first thought, probably just because they’re square. 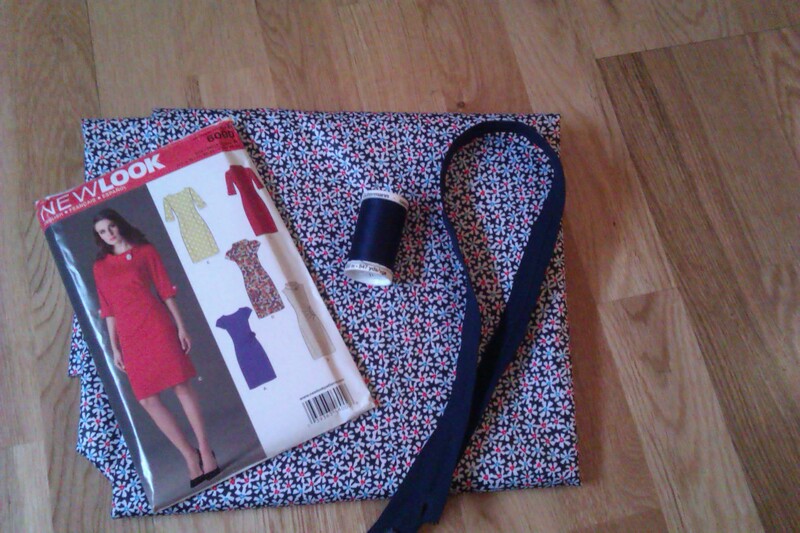 I also was given (also by Fran) some bits of her stash – so I’m building up a nice one of my own. I especially like the brown fabric with the turquoise and orange pattern on (bottom left) and the plain grey (top right). There is quite a bit of some of them a small pieces of some others – again, any thoughts for using them would be great! 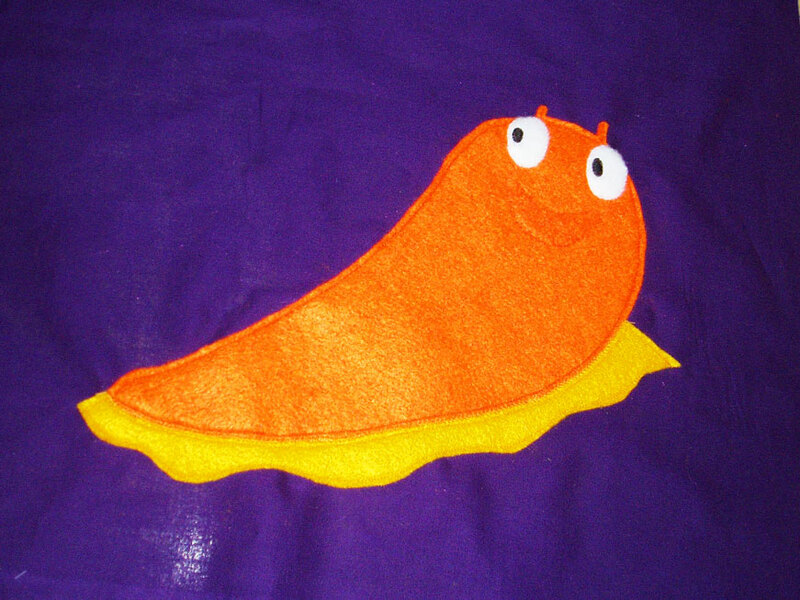 Last year I bought my friend Norman the Slug with a Silly Shell by Sue Hendra for her daughter. Little did I know then the pain I would cause my friend because her daughter loved it so much! She literally knows it off by heart! 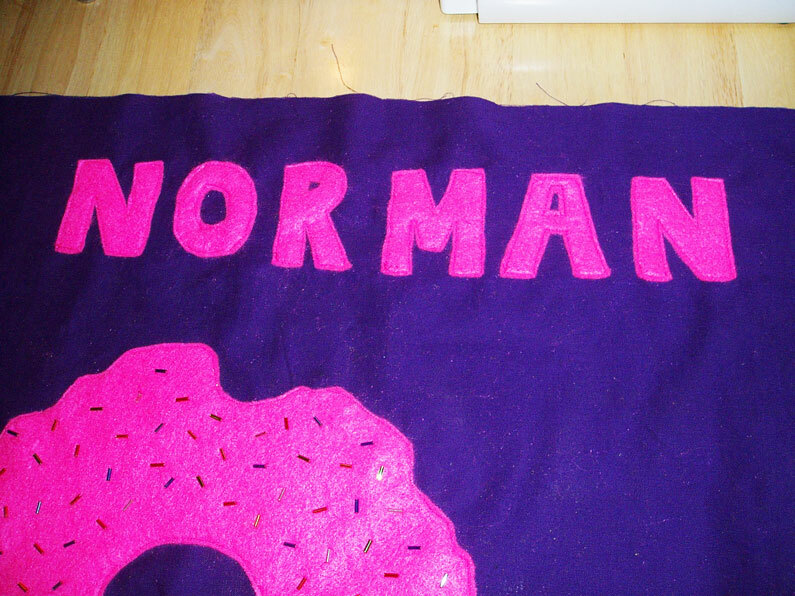 So for this Christmas I decided to carry on the pain by making a wall hanging of Norman. 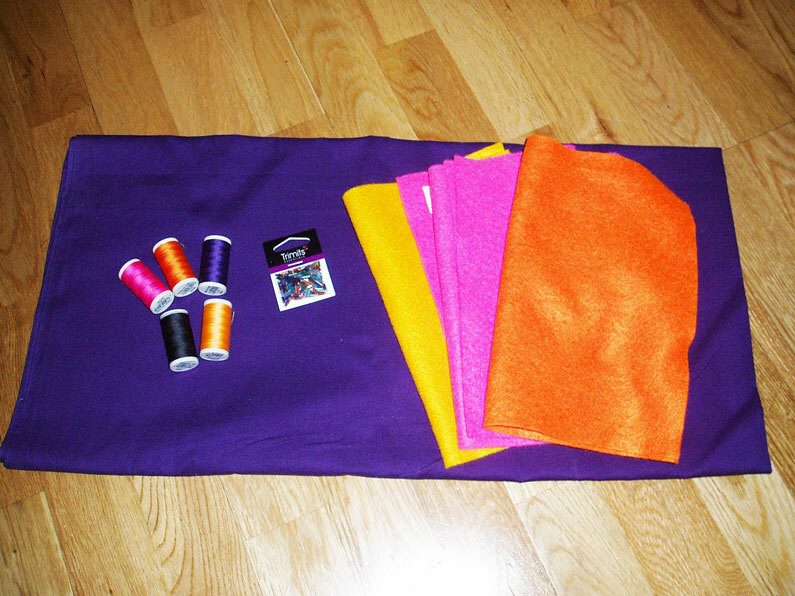 This is what I bought to make Norman – felt in orange, yellow, and 3 of pink. 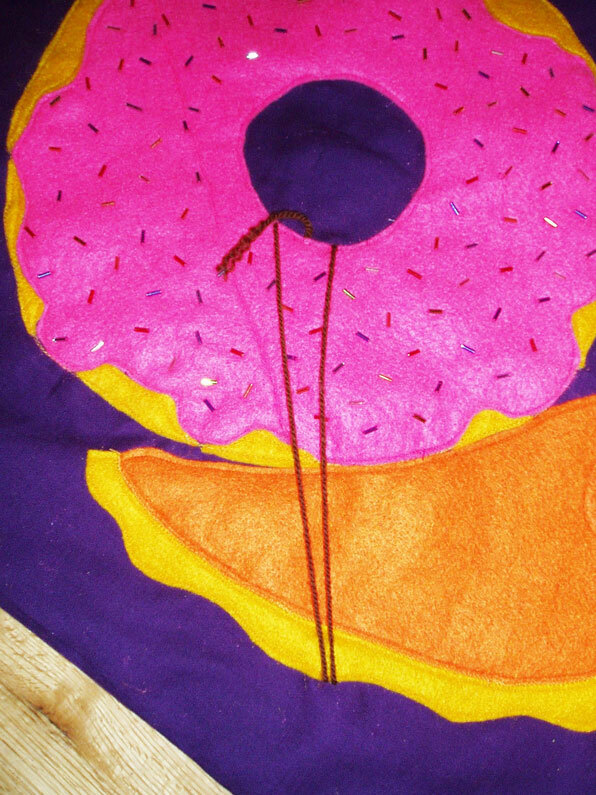 I also got matching thread for all of this and some beads (for the hundreds and thousands on the doughnut) and some purple cotton fabric for the backing – a metre in total I think (so it could be doubled to hide all the stitching). 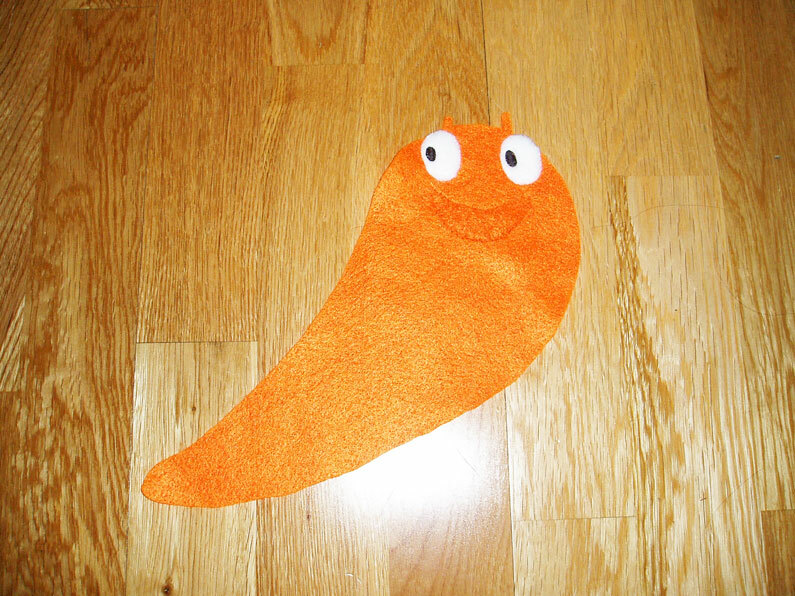 First I made Norman from the orange felt, adding eyes made from a bit of wadding I had lying around (but 2 layers to make it not see-through), and with embroidered pupils. 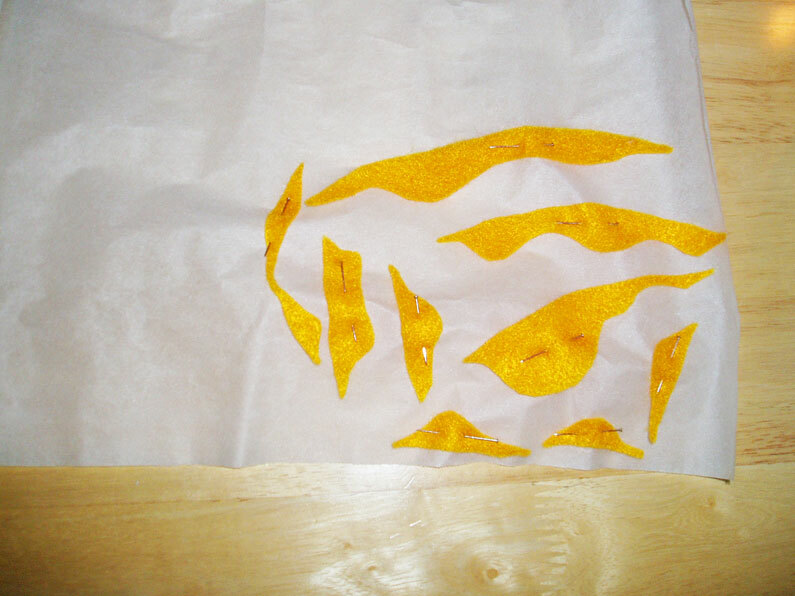 Then I sewing him onto the background…..
….and added on his slime trail. 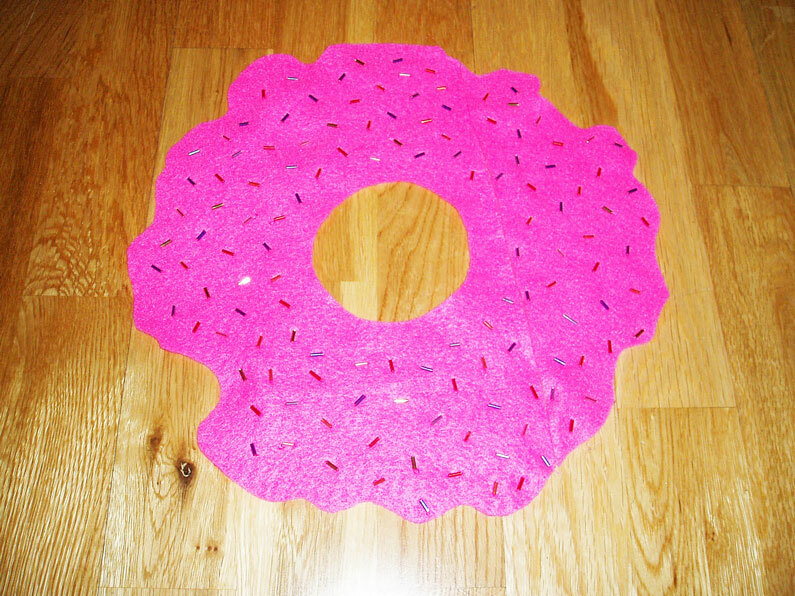 I sewed the bead/ sequins to the pink felt, which I had cut out for the doughnut. 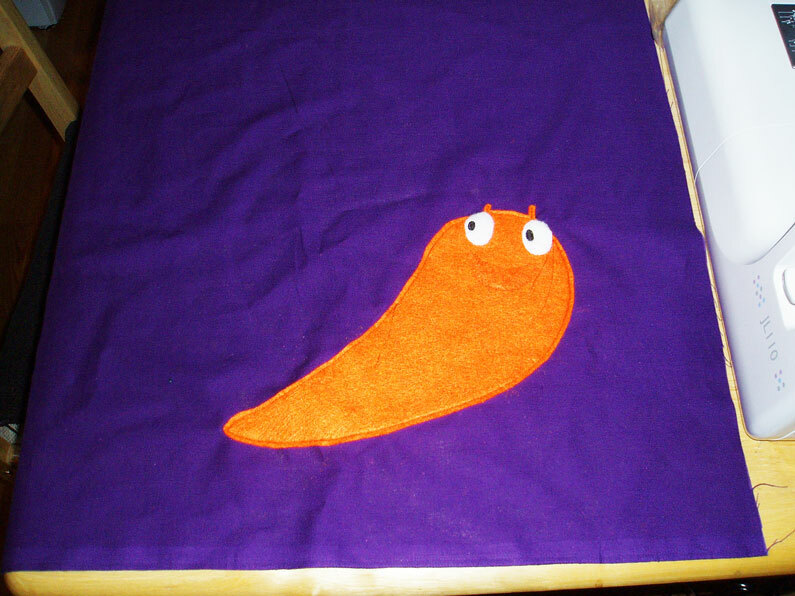 I had to make it in 2 halves because of the size of the felt, which is a bit of a shame but didn’t show too badly. I cut out paper patterns for all the pieces. The doughnut I cut out round, and then cut the pieces out for the irregular icing. I saved the pieces I cut out to make the bread parts of the doughnut for around the edge. I used bondaweb on them as they were so small, so I could stick them to the background and then sew them – pins would have been no good! 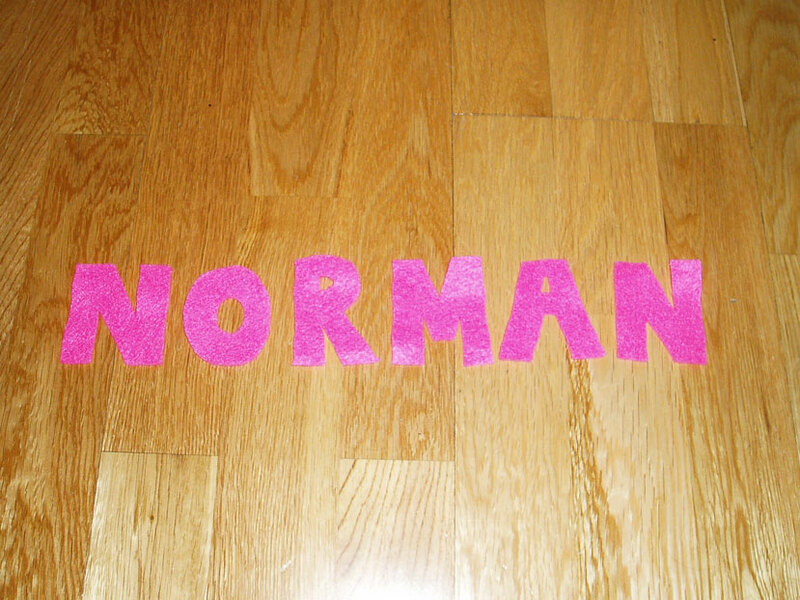 I cut the name out of the same pink felt. All that was left to do was to sew it all on to the background, which was 40cm x 40cm. 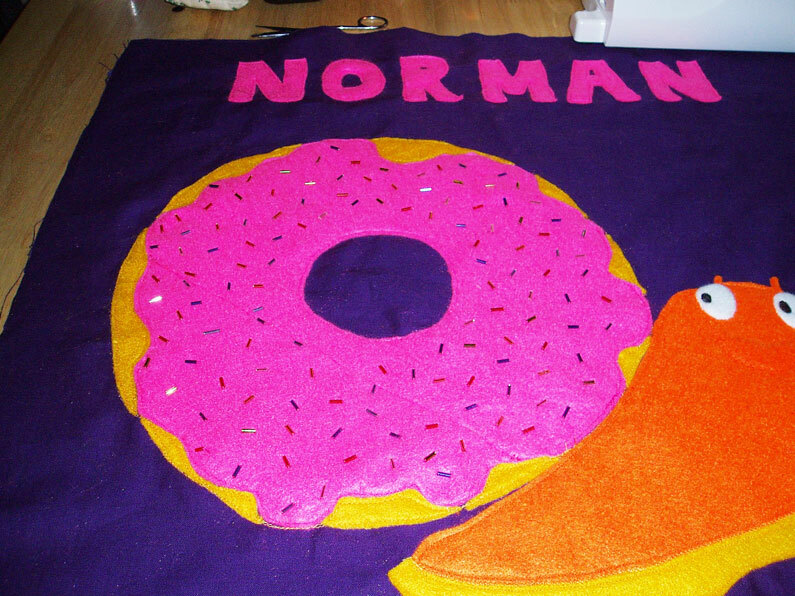 I used a piece of brown wool I had in my stash for the string Norman uses to tie on the doughnut. 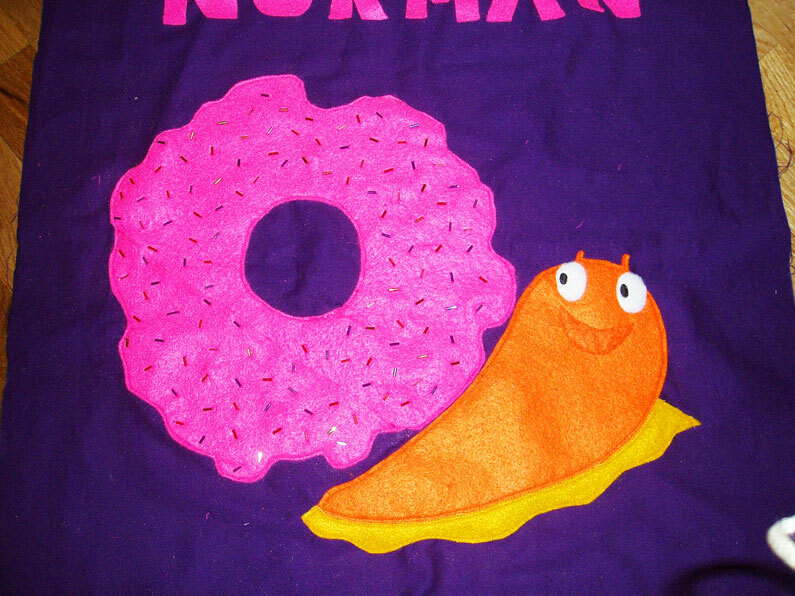 The last thing to do was the loops on the top to hang Norman from. I made them 9cm x 21cm. Sewed them in half lengthways, turned them inside out/ the right way round (the fabric doesn’t really have a back and front) and ironed them so that the seams were in the middle not on one edge. I them placed the loops equally spaced (allowing for the seam allowance), folded in half on top of one of the background pieces, with the raw edges of the loop lined up with the raw edge of the backing piece. 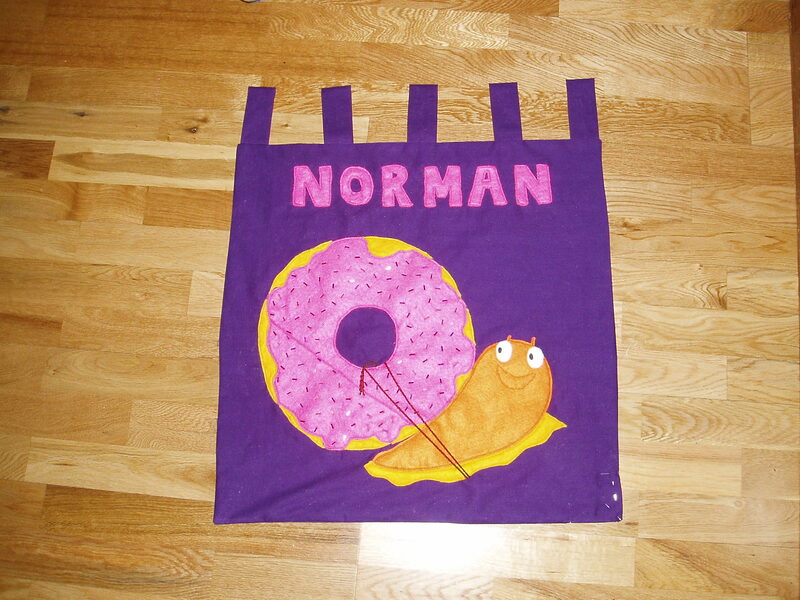 I then put the other backing piece (with Norman on) on top of this, wrong sides together, with the loops in between the 2 pieces and sewed almost all the way around, leaving a gap to turn it the right way around. I then sewed this little gap closed by hand. So my biggest craft fail to date has been socks! This year I did much better at making loads of Christmas presents, especially for my friends at Christmas 2. Last year, however was a different story. 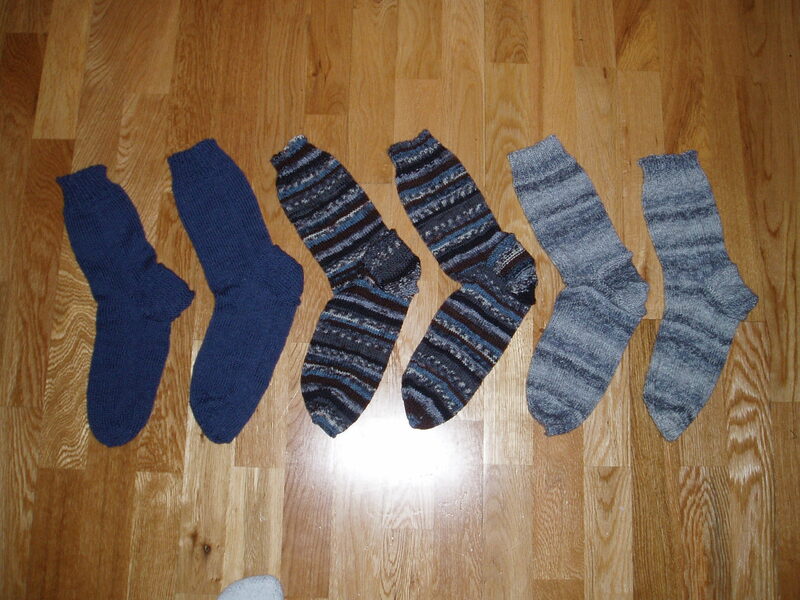 I thought it would be quick and fun to knit a pair of socks for each of the 3 guys in my group. I was wrong. It took me a week less than A WHOLE YEAR to knit them all. I think this is partly because once I’d missed the deadline, there wasn’t really a rush to finish them! It also meant, though, that I didn’t knit much else during the last year as each time I thought about it, I realised I should finish the socks first! I used a free pattern from a little wool shop in Inverurie so I’ll copy it all out here in case anyone wants some knitting punishment. These are not the first thing I knitted in the round, but they may well be the last…..
1 x 100g Ball of Trekking or Opal 4ply sock yarn and a set of 2.5mm DPNs, stitch markers and a needle to sew in the ends. 36sts and 48 rows to 10cm using 2 1/2 needles. Place your stitch markers on your needles when required in the pattern and pass them from left needle to right needle as you reach them. Cast on 60 sts (loosely). Divide these sts evenly over 3 DPNs. Check carefully that sts are not twisted. Bringing your 4th DPN into play, join into a round and mark the start of round, working in a k2, p2 rib pattern for 16 rounds (the first few rounds are always fiddley, however, after a few it does get easier!). 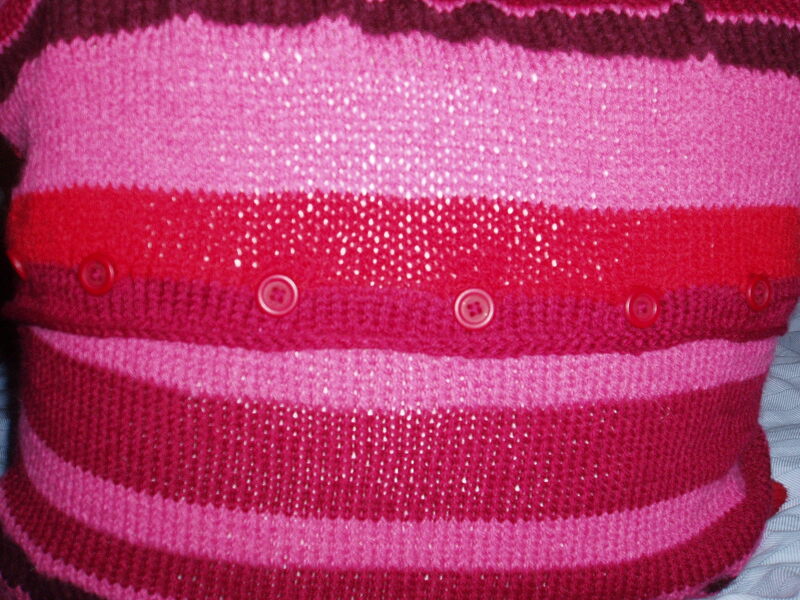 Rounds 17 – 73 (66 rows): knit (by ‘knitting’ every round, you will make stocking stitch). Row 1: slip first st, p29, turn. Move rest of sts to spare needles. Row 2: slip first st, k 29 sts, turn. You will now be working back and forth on these 30 sts and repeating row 1 & 2 a further 14 times (you will have worked 30 rows in total). Row 1: slip first st, p16 sts, p2tog, p1, turn. Row 2: slip first st, k5, Ssk2tog, k1, turn. Row 3: slip first st, p6, p2tog, p1, turn. Row 4: slip first st, k7, Ssk2tog, k1, turn. 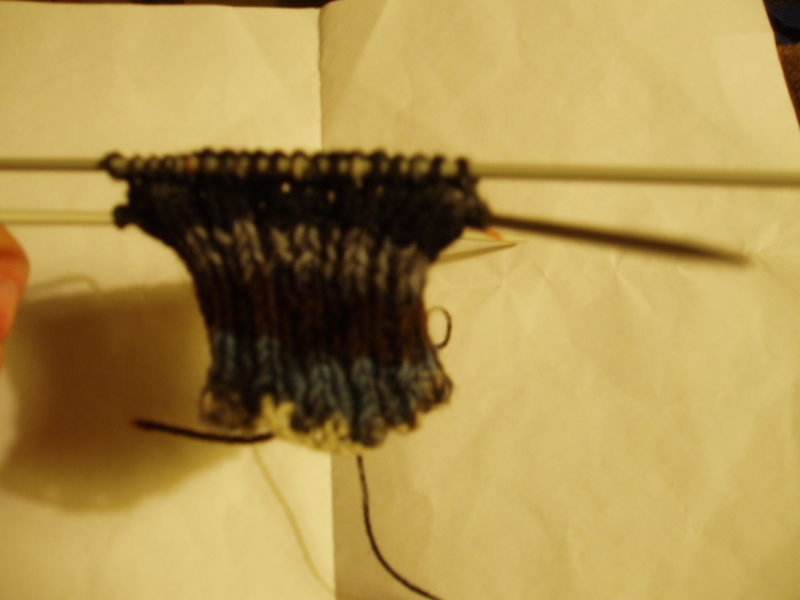 Continue in the same way by taking in one more st every row until all the sts from the heel flap are included. You will now have 18 sts on this needle. Sorry, blurring photo! 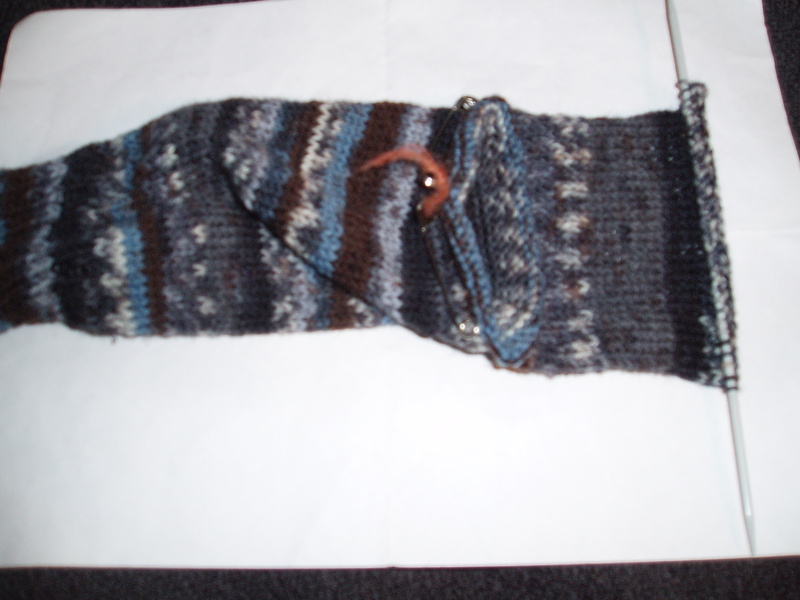 And apparently I stopped taking pictures at this point…..
Gusset:Pick up 15 sts knitwise down side of heel flap, place a marker. 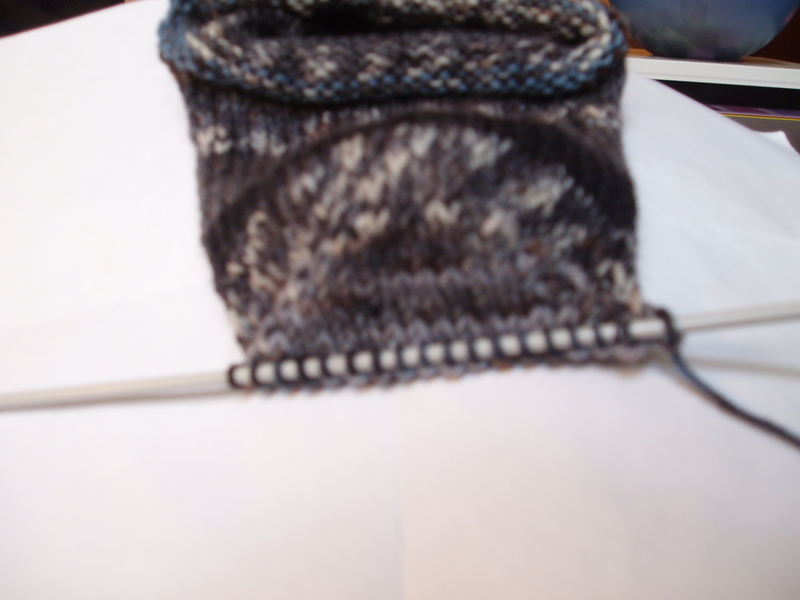 Knit 30 sts from cuff, place a marker, pick up 15 sts knitwise from the other side of heel flap. Arrange these 78 sts on 4 needles and bring a 5th needle into play). Round 1: k to within 3 sts of first marker. K2tog, k1, k to next marker, k1, Ssk2tog, k to end of round. Repeat rounds 1 & 2 decreasing until you have 60 sts left on your needles ending with a round 2. Foot:Knit 48 rounds (or desired length, take out or add in rounds depending on length of foot – I made 2 pairs this length and one pair with 56 rows for my tall friend with large feet). Round 1: knit to 3 sts before first marker, k2tog, k1 (slip marker), k1, Ssk2tog, knit to 3 sts before next marker, k2tog, k1 (slip marker), k1, Ssk2tog, k to end. Repeat rounds 1 & 2 until 24 sts are left, ending on a round 2. Knit to first marker. 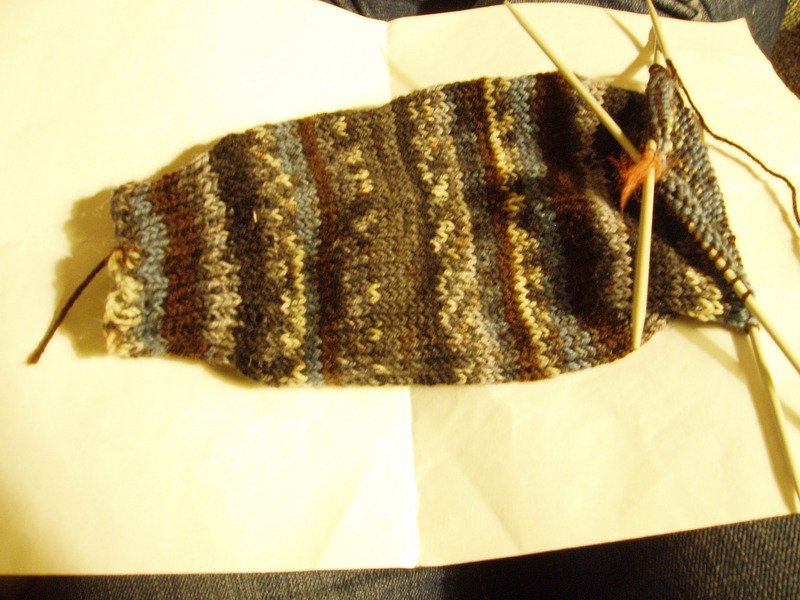 The knitting part of the Sock 1 is now complete. All that remains is to arrange the toe sts so that they can be grafted together. Grafting is a wonderful way of invisibly joining knitting sts. You need to arrange the remaining sts onto 2 needles so that the first 6 and last 6 sts of a round are on one needle and the mid 12 sts are on a second needle. Cut yarn leaving a 20cm length to work your grafting. Thread your length through a needle. 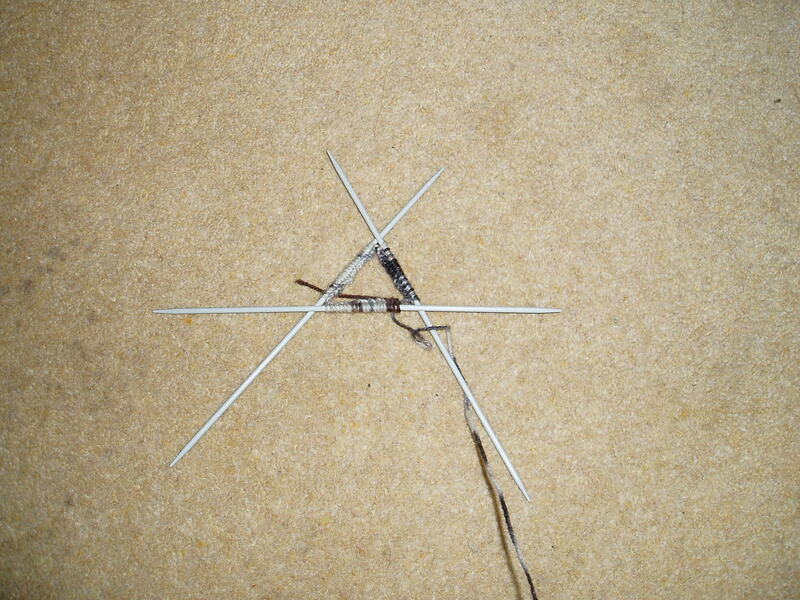 Hold the 2 DPNs together parallel with the thread hanging from the back sts at the right. Put the needle purlwise into first st on front needle and pull yarn through. Put the needle knitwise into first st on back needle and pull yarn through. Repeat from * to * until all the sts have been grafted. Secure the only 2 ends you have neatly to the inside of your sock. All that’s left now is to knit your second sock! I found the pattern pretty easy to follow, except the last bit about the grafting – I didn’t do it right so the toes all looked a bit odd. But I was kind of passed caring by the time I got to the end! When I first got back into knitting a couple of years ago, I tried to make as many Christmas presents as possible. Since I had no life that Winter, I managed to make 2 scarves (which you can see here) and 2 cushions, both of which were stripy and used mostly the same wool (to cut on costs) but with a couple of differences (you can see the other cushion here). 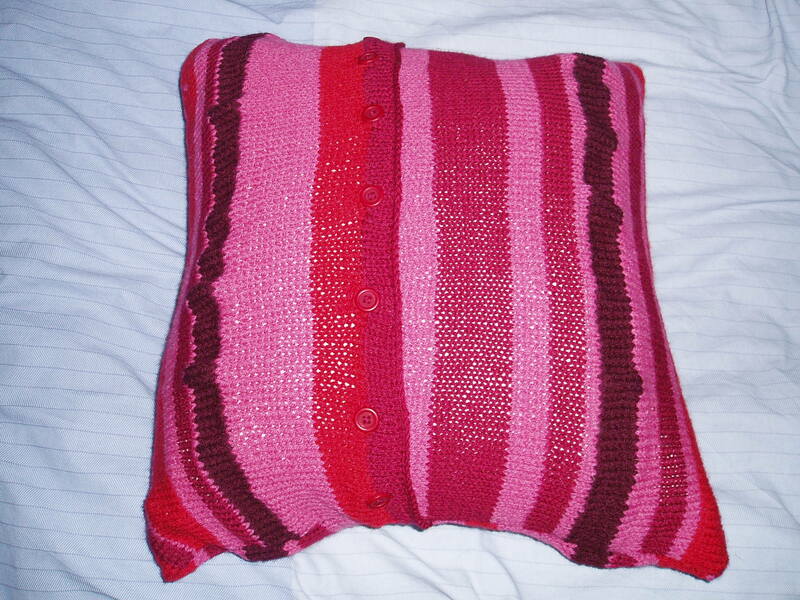 This cushion included pink as it was for my friend Fran and she likes pink. 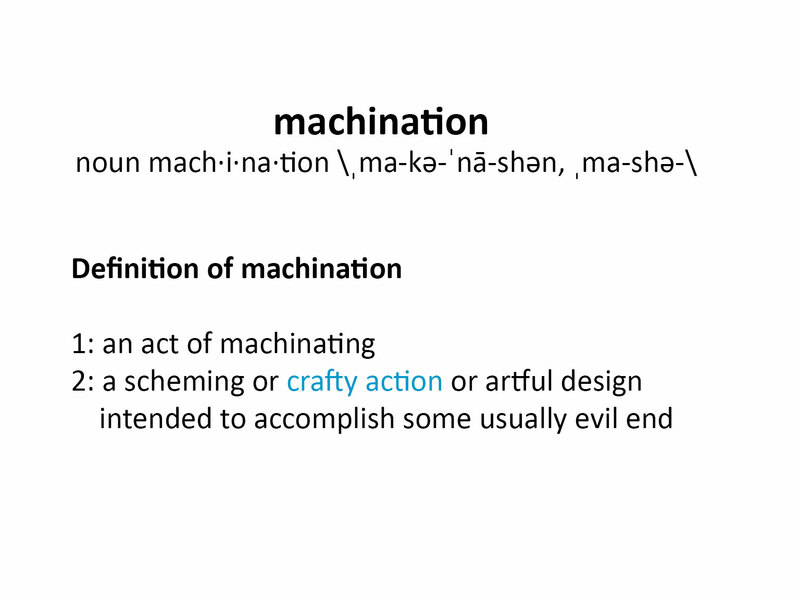 You can find the pattern here – there’s no point me typing it out and I think it might breach copyright or something. I’m not sure if the colours are meant to match on the seams when you sew it all together, but my tension is always a bit off so mine didn’t but I don’t think it affects the look of the cushion at all. Tip: As I said earlier, my tension is always a bit rubbish (i.e. looser than it should be) so I would buy the cushion pad after you’ve finished the knitting to make sure it will fit. Last Christmas I made a rug for my sister, to match the colours of things she and her husband already had in their sitting room. 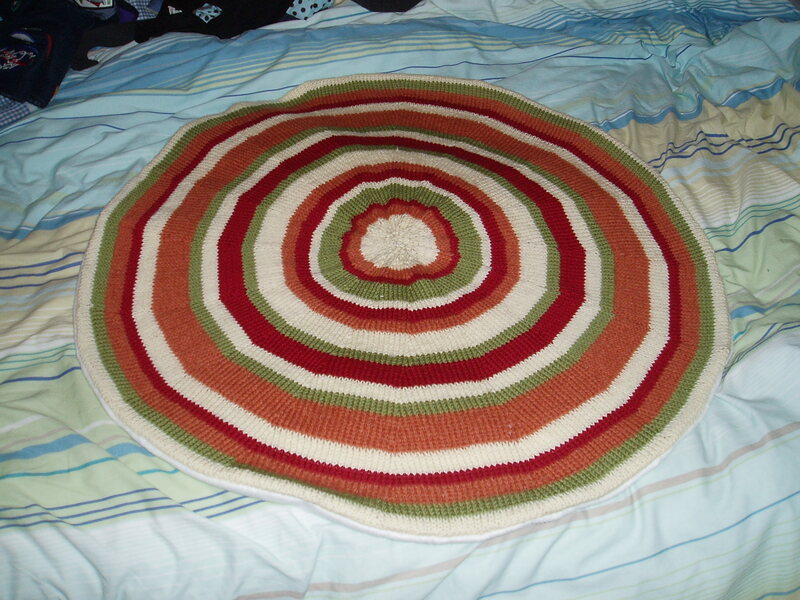 I thought a round rug would be nice so I used the pattern I had already used for the round cushion to make the rug and just kept on knitting until it seemed big enough for a rug (though it’s not massive). 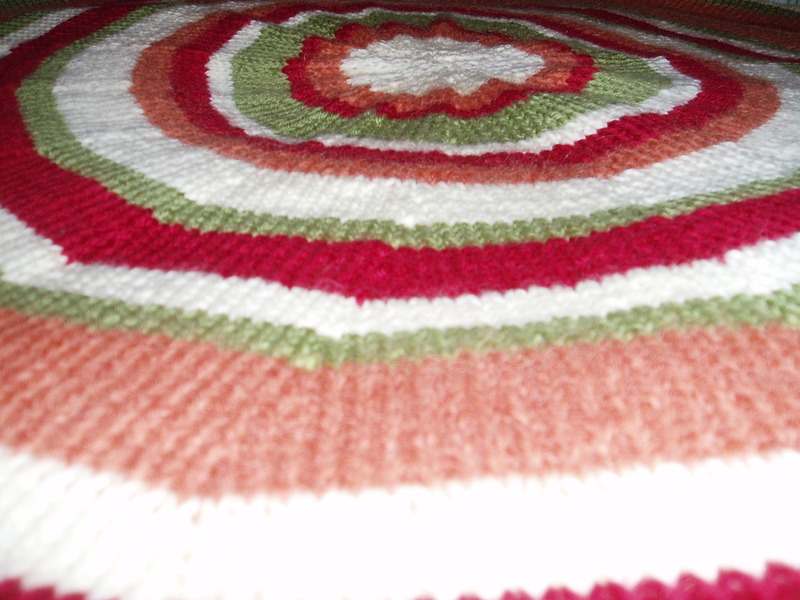 When it got a few rows bigger than the cushion was, I transferred it onto a round needle (though it’s not knitted in the round) because it would no longer fit onto straight needles. I backed it with some quite thick fabric (though I don’t remember exactly what it was) to make it stronger and help it keep its shape.